By owning a puppy you sign up for a long term relationship, with great responsibility. Preparing yourself and your family is the best recipe for success. Please see our article on HOMECOMING PREPARATIONS, NEW PET and NEW DOG to assist you in this process. Common mistakes made by owners are not getting a puppy that suits their needs or fits into their family set up. Not making an informed decision regarding the chosen puppies history or genetics. Please take the time to read through our article on CONDUCTING RESEARCH, aiding you in the search for the perfect puppy. Our main focus of puppy school is the socializing part, therefor the exposure to other puppies. We rarely realise the responsibly that comes with owning a new puppy. Apart from socializing we teach you basic training techniques to improve your owner pet relationship. Getting rid of unwanted behaviour and keeping the good behaviour. We train by method of positive reinforcement. Luring the puppy with a treat, or praise, to convince him where to go or what to do. One could force the bum down when teaching a SIT… what this teaches the puppy is that the pressure will be released as soon as he does it right (release of pressure being the reward). Not our ideal training method but it does work, we just prefer to use positive reinforcement by means of praise, or treats. We work on 5 week cycle, on pre booked Saturday afternoons for an hour class. Depending on the family’s needs, the puppy continues with further training after the course in e.g. 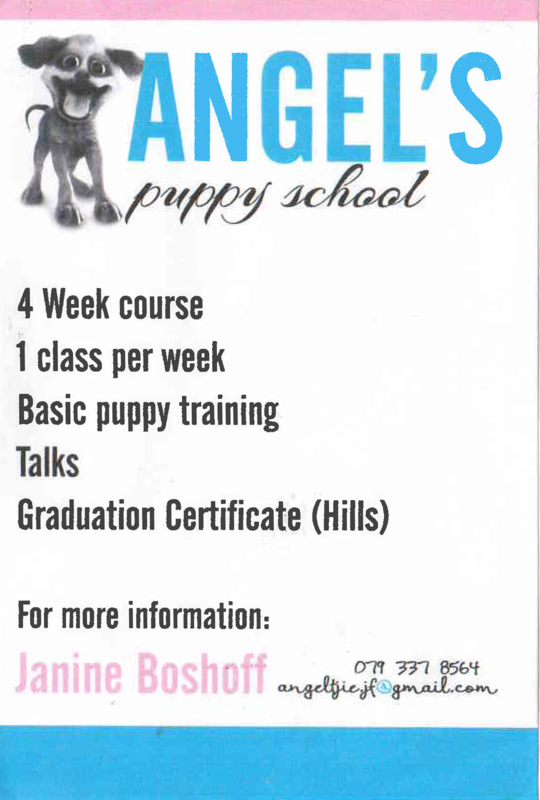 Agility or Obedience training at other schools or just social and reunion classes once a month with the graduating group and other scholars from Pretoria puppy school. Kids are highly encouraged to do the training with their new puppies, so they also have a bigger understanding of the responsibility of the puppies. Knowing that it’s not just limited to feeding and cleaning up. The start of Pretoria Puppy School. Classes reside on the premises of Vetland Animal Hospital spacious green yard. We train by means of positive re-enforcement. Focusing on building a relationship on trust and not fear. An experienced and well trained team support the well-structured and education for our four legged scholars. Vania has been training dogs and puppies for over 6 years, serving 3 practices with the educational and social system that our beloved dogs need. She received her training from the Ethology academy, Dr Quicksy Sonntag (Veterinarian and Behaviorist) – owner and behaviorist at Edupet and Karin Landsberg (Behaviorist) through Thinking. When you bring you puppy in for his/her first vaccinations, please give your name and details to our friendly reception staff at Vetland Animal Hospital so we can inform you about the time and date for the available courses. You can email, sms or phone us on the contact details listed above.